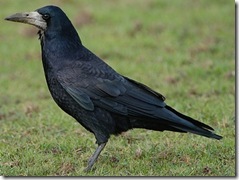 Barry Pennock-Speck's Blog » Blog Archive » Black birds, ravens, crows and bad translations? 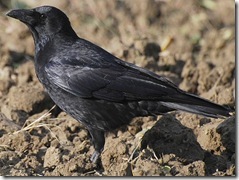 Black birds, ravens, crows and bad translations? 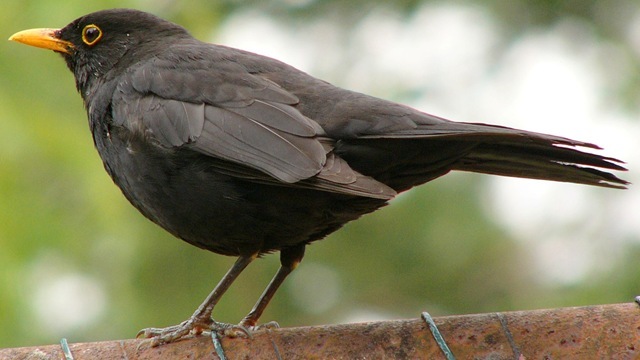 We have all seen black birds (main stress on the word birds) that is, birds that happen to be black -not to be confused with blackbirds (main stress on black) that is, turdus merula in Latin or mirlo in Spanish. There are several all black birds, or birds which look all black. We have just mentioned the blackbird (on the right 25 cms). 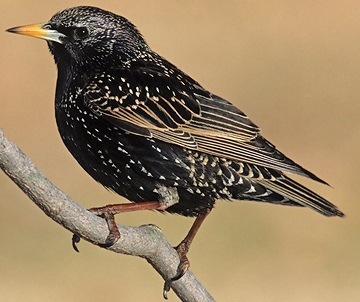 A bird of about the same size is the starling (estornino or in Latin sturnus vulgaris 21 cms) on the left. It is the bird that goes around in giant flocks. They have probably defecated on your car if you have parked under a tree at night. They come to the city to roost as it is several degree warmer in the city than it is in the country. You can tell them apart because they look different and the starling walks while the blackbird hops. By the way, the female blackbird is not black at all but brown! Another group of black birds belongs to the crow family (corvidae). These birds are often confused as they are all, well, black. Let’s have a look at them. From biggest to smallest. First we have the Raven (cuervo 64 cms), then the crow (corneja 47 cms), then the rook (graja 46 cms), and finally, the jackdaw (grajilla 33 cms). I have made the pictures proportional. In any case you can see that the raven is three times the size of a starling and just under twice the size of the jackdaw. You may have noticed that I called the grajo a graja. The reason is that graja is the official name but it seems no-one uses it. Do you remember the film The Crow? What was the translation in Spanish. Yeah, you’re right El Cuervo. 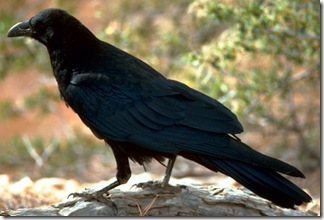 As you can see, a crow is really a corneja in Spanish. I suppose they didn’t call the Spanish film La Corneja because, first of all, it is feminine and secondly, who would go to see a film called La Corneja? You might remember that some black birds were in the news not long back. A pair of birds attacked passers-by to protect their chicks, which had fallen out of their nest. 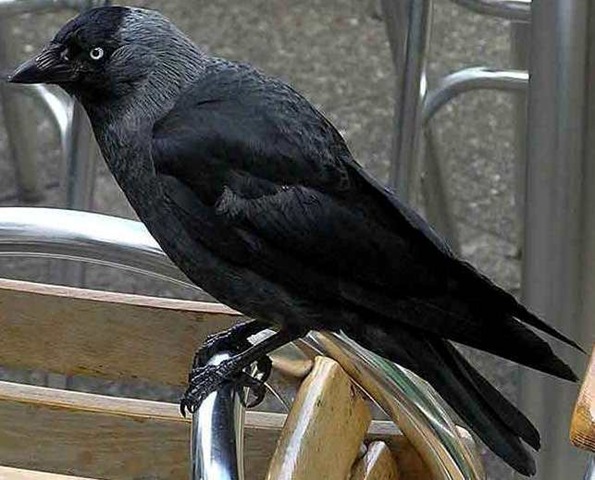 The news was: “Una pareja de grajos ataca a varios viandantes en Sevilla” / “A pair of rooks attacks passers-by in Seville” (see footnote). However, if you look closely you will see that they are really not rooks (grajos) but jackdaws (grajillas). 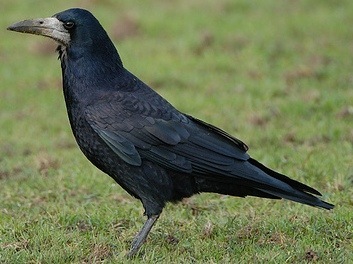 Rooks are normally found in large groups and are a lot bigger and have no grey. Their beaks are white too! Ace reporting, man! The photo has disappeared from their web page so you’ll just have to take my word for it. This entry was posted on 24 January 2009 at 1:39 am	and is filed under General. . You can follow any responses to this entry through the RSS 2.0 feed. Both comments and pings are currently closed.